Donations go directly towards maintaining the Northern Forest Canoe Trail. NFCT's primary focus is the responsible stewardship of our 740-mile waterway. We work with volunteers to provide a clearly marked water route with conveniently located camping sites. In all that we do, we are committed to supporting an excellent recreational experience, while also contributing to healthy waterways and engaged communities. In the spring we open existing campsites, replace trail markers, and inspect access areas and portage paths. Throughout the summer, we manage interns and volunteers who provide maintenance. Our successful Waterway Work Trips and Adopt-A-Segment Program are outreach initiatives engaging our wonderful corp of volunteers. In the fall we celebrate work completed, and in the winter we plan for the next season's projects. Contributions to our Trail Fund make a significant difference in what we can accomplish in the field. We need your support to fully deliver our important programs. 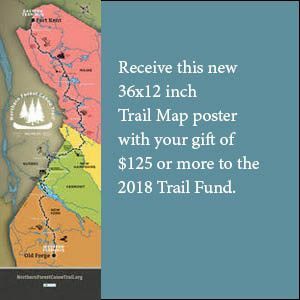 Donations of $125 or more to the 2018 Trail Fund will be the first to receive a new NFCT Trail M­­­­­ap poster. Thank you!